On the day of Pentecost, seven weeks after Jesus’ resurrection, the believers were meeting together in one place. 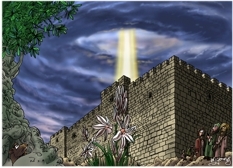 The main light source for this scene comes from the beam of light descending from heaven into Jerusalem. Various Jewish residents of Jerusalem, outside the city walls. This scene is set at the same time as the previous illustration, but seen from outside the walls of Jerusalem. As with the previous picture, the scriptures tell us there was “a sound from heaven like the roaring of a mighty windstorm in the skies” it doesn’t say there was anything more than a sound. I have used artistic licence in adding the visual element of a bright beam of light, since I can’t show a sound in a picture very well! The flowering plant in the middle of the picture is Branched or White asphodel (Asphodelus ramosus) which grows throughout the Holy Lands. It actually flowers between January & April.